HISTORY - CORAL GABLECoral Gables was one of the first planned communities, and prefigured the development of the gated community and the homeowners association. It is famous for its strict zoning regulations. The city was developed by George Edgar Merrick during the Florida land boom of the 1920s. The city's architecture is almost entirely Mediterranean Revival Style. By 1926, the city covered 10,000 acres (40 km2), had netted $150 million in sales with over $100 million spent on development. Merrick designed the downtown commercial district to be only four blocks wide and more than two miles (3 km) long. The main artery bisected the business district. Merrick could boast that every business in Coral Gables was less than a two-block walk. The city used to have an old electric trolley system which was replaced by the popularity of modern automobiles, but now a new free circulator trolley system, initiated in November 2003, runs down Ponce de León Boulevard. During World War II many Navy pilots and mechanics were trained and housed in Coral Gables. 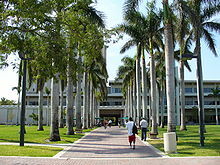 Coral Gables, officially the City of Coral Gables, is a city in Miami-Dade County, Florida, southwest of Downtown Miami. According to United States Census Bureau estimates conducted in 2005, the city had a population of 42,871. Coral Gables is known as a pedestrian-friendly destination. Located four miles from Miami International Airport, the "City Beautiful" has around 140 dining establishments and gourmet shops, and many notable international retailers. Among the landmarks in Coral Gables are the Venetian Pool, Douglas Entrance, the Biltmore Hotel, and many fine residences. Coral Gables is covered by several local and regional radio and television stations, several Coral-Gables-focused websites, and one weekly printed newspaper. The Gables one remaining printed newspaper, The Coral Gables News Tribune, is still published twice monthly and is part of Miami's Community Newspapers, now also online. By 2006, Burger King had announced that it planned to move its headquarters to a proposed office building in Coral Gables. By 2007 Burger King instead renewed the lease in its existing headquarters for 15 years. Burger King planned to consolidate employees working at an area near Miami International Airport and at a Dadeland Mall-area facility into the current headquarters by June of that year. Instead Bacardi USA leased the headquarters complex, a 15-story building. Bacardi consolidated employees from seven separate buildings in South Florida. Several countries have honorary consulates located in Coral Gables. These countries include Belize, Hungary, Senegal, St. Kitts & Nevis, Togo, and Thailand. Coral Gables is the location of the University of Miami, a university ranked in the top tier of national universities,with particular national status in the fields of business, engineering, law, marine science, medicine, communications, and music. Coral Gables schools are part of the Miami-Dade School District, which serves almost all of metropolitan Miami. The district has one high school in Coral Gables, Coral Gables High School, which educates students in grades nine through 12, an elementary school, Coral Gables Elementary located on Ponce de Leon Boulevard and George Washington Carver Middle School is located in Coral Gables. An existing school was moved to the current location on Grand Avenue on land donated by George Merrick. When Carver died in 1942 the school was renamed in his honor.